"This book is one of the most comprehensive books I have reviewed ... it is a must-read for engineers and students planning to remain current or who plan to pursue a career in telecommunications. I have reviewed other publications on WiMAX and have been disappointed. This book is refreshing in that it is clear that the authors have the in-depth technical knowledge and communications skills to deliver a logically laid out publication that has substance to it." "This is the first book with a great introductory treatment of WiMAX technology. It should be essential reading for all engineers involved in WiMAX. The high-level overview is very useful for those with non-technical background. The introductory sections for OFDM and MIMO technologies are very useful for those with implementation background and some knowledge of communication theory. The chapters covering physical and MAC layers are at the appropriate level of detail. In short, I recommend this book to systems engineers and designers at different layers of the protocol, deployment engineers, and even students who are interested in practical applications of communication theory." "This is a very well-written, easy-to-follow, and comprehensive treatment of WiMAX. It should be of great interest." " Fundamentals of WiMAX is a comprehensive guide to WiMAX from both industry and academic viewpoints, which is an unusual accomplishment. I recommend it to anyone who is curious about this exciting new standard." "Andrews, Ghosh, and Muhamed have provided a clear, concise, and well-written text on 802.16e/WiMAX. The book provides both the breadth and depth to make sense of the highly complicated 802.16e standard. I would recommend this book to both development engineers and technical managers who want an understating of WiMAX and insight into 4G modems in general." " Fundamentals of WiMAX is written in an easy-to-understand tutorial fashion. The chapter on multiple antenna techniques is a very clear summary of this important technology and nicely organizes the vast number of different proposed techniques into a simple-to-understand framework." " Fundamentals of WiMAX is a comprehensive examination of the 802.16/WiMAX standard and discusses how to design, develop, and deploy equipment for this wireless communication standard. 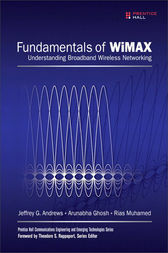 It provides both insightful overviews for those wanting to know what WiMAX is about and comprehensive, in-depth chapters on technical details of the standard, including the coding and modulation, signal processing methods, Multiple-Input Multiple-Output (MIMO) channels, medium access control, mobility issues, link-layer performance, and system-level performance." "This book is an excellent resource for any engineer working on WiMAX systems. The authors have provided very useful introductory material on broadband wireless systems so that readers of all backgrounds can grasp the main challenges in WiMAX design. At the same time, the authors have also provided very thorough analysis and discussion of the multitudes of design options and engineering tradeoffs, including those involved with multiple antenna communication, present in WiMAX systems, making the book a must-read for even the most experienced wireless system designer." "This book is very well organized and comprehensive, covering all aspects of WiMAX from the physical layer to the network and service aspects. The book also includes insightful business perspectives. I would strongly recommend this book as a must-read theoretical and practical guide to any wireless engineer who intends to investigate the road to fourth generation wireless systems." "The authors strike a wonderful balance between theoretical concepts, simulation performance, and practical implementation, resulting in a complete and thorough exposition of the standard. The book is highly recommended for engineers and managers seeking to understand the standard." " Fundamentals of WiMAX is a comprehensive guide to WiMAX, the latest frontier in the communications revolution. It begins with a tutorial on 802.16 and the key technologies in the standard and finishes with a comprehensive look at the predicted performance of WiMAX networks. I believe readers will find this book invaluable whether they are designing or testing WiMAX systems." "This book is a must-read for engineers who want to know WiMAX fundamentals and its performance. The concepts of OFDMA, multiple antenna techniques, and various diversity techniques–which are the backbone of WiMAX technology–are explained in a simple, clear, and concise way. This book is the first of its kind." "Andrews, Ghosh, and Muhamed have written the definitive textbook and reference manual on WiMAX, and it is recommended reading for engineers and managers alike." WiMAX is the most promising new technology for broadband wireless access to IP services. It can serve an extraordinary range of applications and environments: data, voice, and multimedia; fixed and mobile; licensed and unlicensed. However, until now, wireless professionals have had little reliable information to guide them. Fundamentals of WiMAX is the first comprehensive guide to WiMAX–its technical foundations, features, and performance. Three leading wireless experts systematically cut through the hype surrounding WiMAX and illuminate the realities. They combine complete information for wireless professionals and basic, accessible knowledge for non-experts. Professionals will especially appreciate their detailed discussion of the performance of WiMAX based on comprehensive link- and system-level simulations. Whether you're a wireless engineer, network architect, manager, or system designer, this book delivers essential information for succeeding with WiMAX–from planning through deployment. Jeffrey G. Andrews is an assistant professor at The University of Texas at Austin. He has developed CDMA systems for Qualcomm and consulted with many organizations including the WiMAX Forum, Microsoft, and NASA. He is a recipient of the NSF CAREER Award and holds a Ph.D. from Stanford University. Arunabha Ghosh, a principal member of technical staff at AT&T Labs, specializes in wireless communication theory and signal processing and has been involved in standardization efforts in the WiMAX Forum. He holds a Ph.D. from the University of Illinois at Urbana-Champaign. Rias Muhamed is a lead member of technical staff at AT&T Labs. He has led several research and technology assessment projects in fixed wireless broadband at AT&T Labs. He is a senior member of the IEEE and holds an M.S. from Virginia Tech.